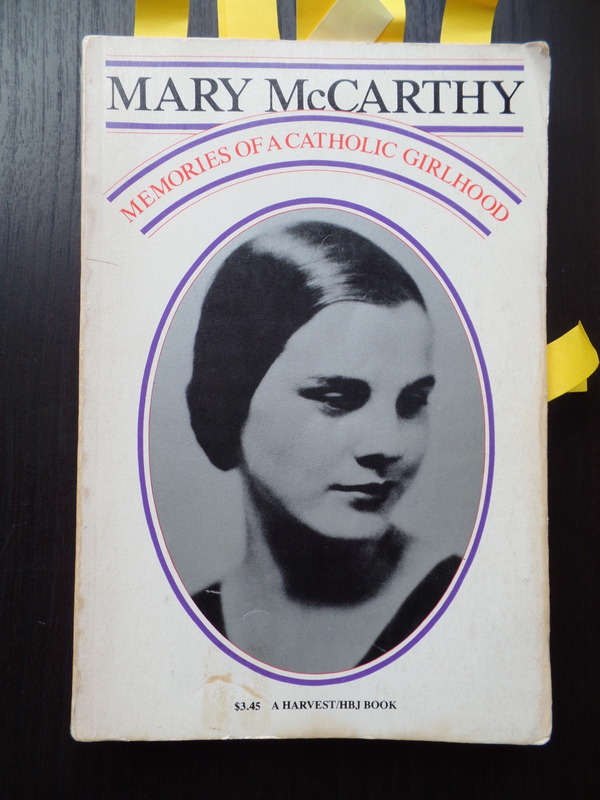 Girlhood Memories from Mary McCarthy – The Bookshelf of Emily J.
I loved this book! I absolutely loved it. Yes, it was a collection of essays about author Mary McCarthy’s childhood that at times were written intellectually, but it had the charm and flourish of her creative voice. After each chapter, she included a commentary chapter, explaining how much of the essay was true and how much of it she had fabricated or compiled with other memories. She tested the boundaries of creative non-fiction through these analyses of her own writing, and helped us to see more about the facts of her young life and who her family members were, rather than leaving us with the stark and vivid descriptions through the stories. To me, this dual account of each memory, can be described by my favorite line from the book: “the trap of adult life, in which you are held, wriggling, powerless to act because you can see both sides” (p. 189). She writes both sides for us. However, she wrote this line in relation to a story of her traveling on a train, in which she meets two nice couples, but is then warned by the train conductor that these couples are switching bunks at night. He doesn’t come out and say it, but he warns her, as a good, young, innocent, and pure girl, that they are homosexuals. Mary is caught in the trap of wanting to please the conductor by not being seen with these people again, but also enjoying the company of the couples and not wanting to hurt their feelings and cause strife by cutting off all contact with them. Most gripping to me was her account of what it was like to be orphaned, because her parents died in the flu epidemic of the early 1900s. She ended up living with her paternal grandparents, and then her aunt and uncle. However, these people were awful to her and her brothers. They put them on a special diet of mushy and bland food, while their uncle ate richly and loudly in front of them. Her aunt and uncle would tape their mouths shut each night, forcing them to breathe through their noses. In the mornings, the tape would leave a sticky goo on their faces, which Mary remembers never being able to get quite clean. They weren’t allowed to play with their toys except on Christmas morning. Mary noted, “ The fact that our way of life resembled that of an orphan asylum was not a mere coincidence” (p. 71). Most awful, her uncle stole her younger brother’s toy butterfly and blamed it on Mary. She refused to admit the crime, and her aunt believed her, but her uncle placed the butterfly at Mary’s spot at the dinner table, and it is revealed after dinner is cleared. Mary is beaten, even though her aunt sort of realizes what really happened. Mary is eventually lucky enough to go live with her maternal grandparents in Washington state. Here, she is more free to read books, play, socialize, and think. During these chapters, we hear wonderful stories about her grandfather. We also learn about how she became an atheist. Her conversations with the priests at her Sacred Heart school are quite entertaining, and while Mary just wants answers to her deep and burning questions and contradictions, the priests see her as trying to cause trouble and trip them up on purpose. Of her religion, she wrote this: “The Catholic religion I believe, is the most dangerous of all, morally . . ., because, with its claim to be the only true religion, it fosters that sense of privilege I spoke of earlier—the notion that not everyone is lucky enough to be a Catholic” (p. 23). I’ve seen similar pride in my own religious community. Similar to this is the prosperity myth, which is problematic for many reasons, especially when believed in from a religious perspective. She concludes, “If the kind of God exists Who would damn me for not working out a deal with Him, then that is unfortunate. I should not care to spend eternity in the company of such a person” (p. 27). She described her “religion as a branch of civics and conformity” (p. 104). The middle of the book includes a section of glossy black and white pictures, which makes the people in McCarthy’s stories come to life. It was lovely to see the pictures of her parents when they were young and engaged. It made me sad that they had both died so young and that Mary and her brothers did not get to know them very well. The most funny incident is when Mary cuts her leg one evening by accident at the convent school, and then the next morning has blood on her sheets. She tries to explain to the nun what had happened, but the nun thinks Mary has started menstruating and won’t listen to her explanation. “There was no use fighting the convent. I had to pretend to have become a woman, just as, not long before, I had had to pretend to get my faith back—for the sake of peace. This pretense was decidedly awkward. For fear of being found out by the lay sisters downstairs in the laundry . . ., I reopened the cut on my leg, so as to draw a little blood to stain the napkins, which were issued me regularly not only on this occasion, but every twenty-eight days thereafter” (p. 134). What an awkward situation! This was a delightful read, one that I’m glad I came across. I’ve never actually read any of McCarthy’s fiction, which I know was highlighted in Oprah’s book club, so I guess that should be the next direction my fiction reading takes me. Have you read any Mary McCarthy? What should I start with? I haven’t read any fiction by McCarthy, although I keep meaning to. What horrible relatives these poor children had! Yeah, the first few sections were heartbreaking, but probably more common than we realize. Some of the treatment just seemed to arbitrary. What kind of adult steals something and frames it on a child just to make trouble? Not a very mature one. To be honest, this uncle reminded me a little of my step-dad. And McCarthy mentioned that many people her age, after reading this, reported having had similar experiences growing up. Mean parenting phase, I guess. You’re welcome, Emily. I’m moving into a new phase of reblogging, so it’s nice to find interesting posts elsewhere. I can’t help but think about how sad her parents would be to know how their children were treated after they died. This sounds good, though. I haven’t read anything by her either, so I have nothing to recommend. I think that Laura from Reading in Bed is doing a read-along of her book The Group sometime this summer, though. I’m hoping to join if I’m not too busy, and depending on when it is. Thanks for telling me about the read-along. I’ll have to check it out. This does sound interesting especially that she then explains her perspective of each story. I don’t recall knowing this author’s work but I’ll definitely look into it. I’m curious about her take on religion and atheism. Also, I like your new blog format! Looks nice and it’s easy to use! Thanks, Denise. I’m liking the format too, but not really liking the teeny tiny font. Oh well. I think you might like this book! Sounds like an interesting read. I going to get it. How about you? Nice to get introduced to Mary MacCarthys writings..thanks. You’re welcome. I hope to read more of her work soon!